Analysts feel that the pain of GST roll-out is almost over as consumption has picked up. Mumbai: Smart rebound from the lows of the goods and services tax (GST) implementation helped companies post the sharpest net profit growth in nine quarters during the three months ended June, an analysis of earnings data showed. However, the numbers still failed to hit market expectations, thanks to costlier raw material and a weak rupee. Meanwhile, consumption growth continued to recover in rural areas, indicating the fading effects of the GST roll-out. 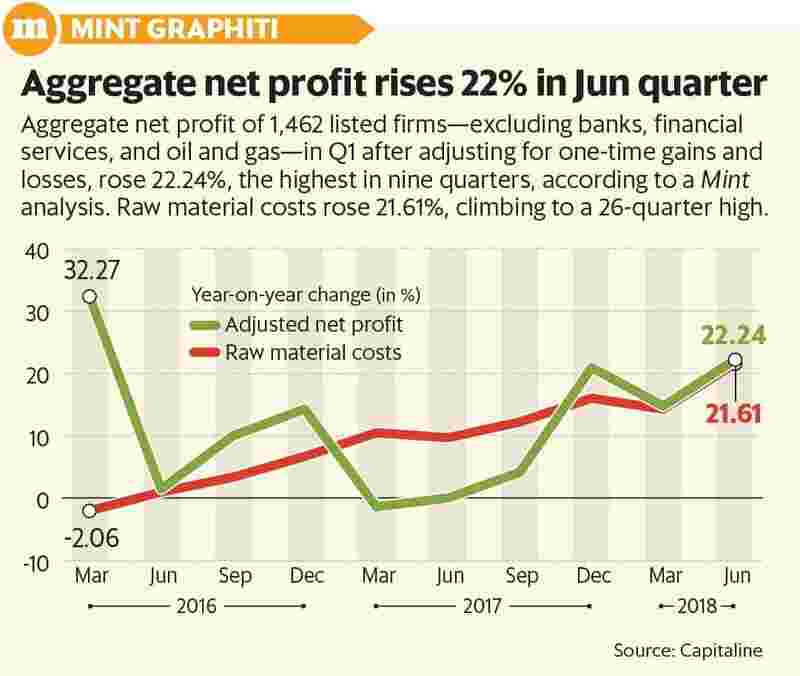 A Mint analysis of 1,462 listed companies showed that aggregate net profit, after adjusting for one-time gains and losses, rose 22.24% in the first three months of 2018-19. According to data provider Capitaline, the corresponding figure for the same set of companies was 14.84% in the March quarter, and a meagre 0.01% in the April-June 2017 period. The data excludes banks, financial services firms, and oil and gas companies. Neelotpal Sahai, head of equities at HSBC Global Asset Management India, said the trends so far were broadly along expected lines at an aggregate level. “However, if we exclude the likes of Tata Motors and instances of higher provision-related losses from corporate-focused banks, the earnings delivery has remained good in Q1. This is in line with our view of the earnings recovery process well and truly underway." However, other analysts said the performance could have been much better due to the lower base last year. According to Gautam Duggad, head of research at Motilal Oswal Institutional Equities, earnings on an aggregate level disappointed, and downgrades still outweigh upgrades by more than two times. “The narrative has not changed in the last few quarters. Overall, we have downgraded Nifty FY19 earnings per share (EPS) estimates by more than 4%. The auto universe has missed across-the-board and will go down as the big miss for the quarter. Non-banking financial companies and metal companies reported good set of numbers, as has been the trend in the last few quarters," he said. Rusmik Oza, senior vice-president and head of fundamental research, Kotak Securities, agreed: “The lower base should have led to better earnings than what we have seen." Raw material costs for the same set of companies touched a 26-quarter high during the period. Brent crude prices were up 14.25% in the June quarter, and are now up 9.57% for the year so far. Aluminium prices on the London Metal Exchange (LME) surged 8.4% and China’s domestic hot rolled steel sheet spot average price nearly 11% in the June quarter. The rupee has weakened 8.62% in all of 2018, and 4.81% in June quarter. Vinod Karki, vice president, strategy, at ICICI Securities Ltd, feels that raw material cost continued to impact margin although companies have been offsetting the effect by cost-control measures. “However, food prices have been benign. Rupee weakness has helped boost the margins of exporters while the impact on imported inflation will be visible going ahead." Oza said margins of manufacturing companies on an overall basis shrank 200 basis points in Q1. “Commodity prices and a weak rupee have marginally impacted gross margins for manufacturing companies. The positive impact of a weak rupee is mainly visible in technology stocks." According to Oza, the positive impact of GST is visible in the earnings of organized players, and will be felt more in the coming quarters. Analysts also feel that the pain of GST roll-out is almost over as consumption has picked up. “The consumption trends look promising with the expected pick up in rural demand (higher MSPs for Kharif crops), normalized festive season (devoid of disruptive events like demonetization or GST) and chances of a normal rainfall," said Sahai. Meanwhile, interest costs for these companies were marginally up at 5.98% while interest coverage ratio (ICR), which measures the ability of businesses to service their interest costs, was up 3.84% in Q1. Though markets are running ahead of fundamentals with earnings growth yet to pick up, analysts are hopeful of a recovery by the end of this fiscal year. Oza said earnings recovery is underway and expects healthy double-digit growth for Nifty 50 in FY19. “The earnings growth of mid-cap companies should also be in double digits. Post Q1 results, we have seen earnings estimates being cut by analysts. At the start of this fiscal year, Bloomberg consensus earnings growth of Nifty and the Mid Cap Index was 20% and 28%, respectively, which post Q1 results has come down to 15% and 10%, respectively."